Karina's Kreations: Easy Hedgehugs Card! Doesn't everyone need a hedgehog card in the mail? I fell in love with this set the minute I saw it. I love the cute animal images but I especially loved the hedgehogs. They are so cute!! This is a very easy card to make. I started with a piece of Powder Pink card stock cut at 5-1/2" x 8-1/2" and folded it in half. A 3/4" x 5-1/5" piece of Painted with Love Specialty Designer Series Paper was added to the card. The hedgehog was stamped with Soft Suede ink on Whisper White card stock and cut out with the Stitched shaped framelit dies. 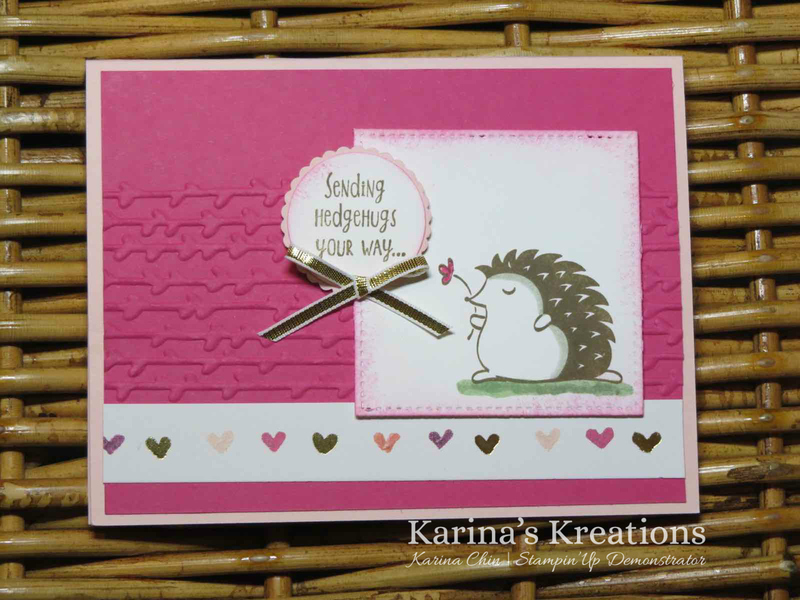 The hedgehog was colored with Melon Mambo, Sahara Sand and Wild Wasabi Stampin' Write markers. The edge was sponged with Melon Mambo ink and attached to the card with a Stampin' Dimensional. The greeting was stamped on Whisper White card stock and punched out with the 1-1/4" circle punch. I attached it to 1-3/8" scallop circle. Click on the supply list to start shopping.